Location: National Western Complex, Denver Colorado. 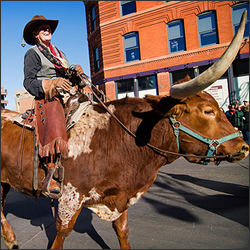 If rodeos, livestock, wonderful arts and crafts, shows and more are in your families interest, then you simply cannot miss the annual National Western Stock Show that takes place in Denver Colorado. Families, don’t miss the rodeo, muttin’ bustin’, livestock shows, petting zoo and exhibits, and more!